Abandoning Marrakech is leaving the heat behind. 170km to the west, Essaouira presents itself as a port city full of air, with sun but no heat. The beach is long, the sand is smooth and the wind cools the atmosphere. Air is one of the leading characters in this spot, where you can breathe a peace impossible to find in Marrakech. The sand is another one. Near the beach, the wind punches the land and the water is brownish and calmed. 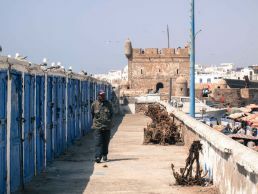 Essaouira is a town full of artisans where seagulls rule, hungry because of the fresh fish sold at the port. But the seagulls can’t control one thing, a wind so strong that rules over all. A fisherman wandering around in the Port of Essaouria, Morocco. Trying to sunbathe in any corner of Essaouira’s beach is a challenge only suitable for brave people. While the tide kicks in several meters in a couple of minutes and forces everyone to retreat, the wind keeps its pulse with those who try to roll out their towel, a towel that will certainly end up full of fine sand. Only a few men expose their skin. The women are dressed in the same way as if they were going to the market. 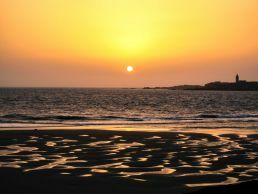 In the afternoon, the sunset views over the top of some rocks in the far end of the beach is the reward to those who agree to a journey usually tried by quads and camels. Before, at lunchtime, a fish soup is very welcomed, one of the great gifts given by this peaceful fishing town. The sound of the seagulls is the only thing that breaks the voice of the intense wind. Essaouira bids us farewell with a dense morning fog that spits water and wind in equal parts. The ambiance today is more relaxed than yesterday, friday, the weekly holiday in Morocco. It’s favorably surprising the quality of the food in practically all restaurants tested. Their hospitality is also praiseworthy. In one restaurant that consists in one single large table, where Moroccans, Germans and Catalans share a tea, clients and owners also share musical instruments. For one night they form a small family. There’s no need to know each other, only improvise and have a good time together. Happiness doesn’t know about languages or nationalities. 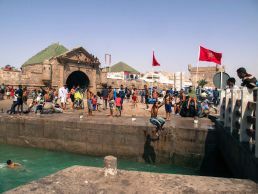 Some kids have fun with the sea in the Port of Essaouira.